By my best guess in talking to the locals, the 45-degree weather is a bit chilly for late March. A cold front blew through and shifted the wind from the familiar southerly direction to the north. It isn’t a hard wind (at least by Texas Panhandle standards) but is steady nonetheless. It’s colloquial handle is apropos. From the dock, I make small talk with our fishing guide Brian as the sun comes up behind me. Looking west I can just barely see the other side of the lake because it’s so far away. As a natural, brackish water lake, this is a big one. At just shy of 50,000 acres, redfish and speckle trout abound in the immense body of water that averages only about 3 feet deep. Once in the boat, Brian lowers it from the slip and we soon are skimming across the water in the center console vessel on our way to our morning’s fishing grounds. Just shy of half an hour after the sun came up, the air is chilly and I do not have a jacket so I hunker on the seat behind the console so that the windshield blocks the air. 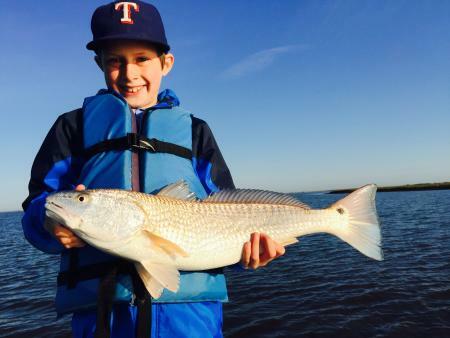 “There’s redfish feeding around here,” he says referring to the way that feeding redfish disturb the water’s surface and leave “slick” spots in their wake. So we cast in their direction - using plastic jigs that mimic shrimp as bait and bouncing them across sand and oyster beds in the skinny water. Unfortunately, the shift in wind and the recent inundation of water flowing into the lake from recent rainfalls left the water stained a cappuccino-looking hue. Therefore, the fish weren’t biting. I wasn’t worried, however. The outdoors is and should be more attuned to the experiential lessons at hand. I look to the boat’s stern and my ten year old boy is casting and jovial. He doesn’t care that we haven’t caught a fish so why should I? He’s happy so I’m happy. That’s really all that matters. “Daddy,” he always says before asking a question or making a statement spontaneously. Truthfully I cannot remember the question he asked but I never tire of hearing him call me that. The gravity and importance of that title is an honorable one and I do not take the responsibilities therein lightly. I never have. Considering all the negativity and selfishness that’s both in the world at large including that which many inflict upon themselves, being on a lake on perfect Louisiana morning not catching fish is a pretty good place to be. A couple casts later, Brian lands a hook from the bow of the boat and tells Ryan that he can’t reel it in a needs his help. Ryan hurries to the front and takes the bait-casting reel in his hand and commences the fight. Ryan has caught fish before so he knows the drill and plays the fish until he is at the boat’s side and Brian nets him. “Daddy,” preludes Ryan, as we climb into the SUV to head away from the docks. “Can we come here again?” One fish in four hours and he wants to come again. Russell Graves has been traveling the country telling authentic Texas stories with his camera and his words - both written and spoken since 1989. After leaving a 16 year career of teaching agricultural science in 2009, he continued to photograph, write, and speak about his experiences and the people he meets. Currently, Russell lives in the country north of Childress, Texas with his wife Kristy and their two children Bailee and Ryan. For more videos, images, and articles, check out http://www.russellgraves.com/.